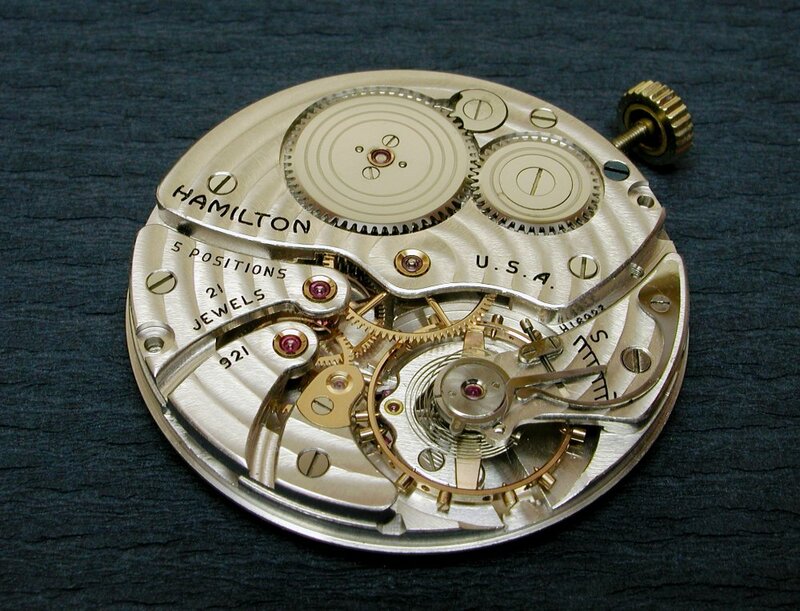 The Hamilton Grade 921 is a 10 size movement that was introduced in 1936. The 10 size movements superceded the slightly larger 12 size grades to become Hamilton's late range of gentlemen's size pocket watches. The movements measure around 38mm and when cased-up the watches are up to around 45mm in diameter. Even moreso than the older 12 sizers these 10 size pieces can be very slim and petite depending on the casing. Over 54,000 examples of the Grade 921 were produced up until 1954. 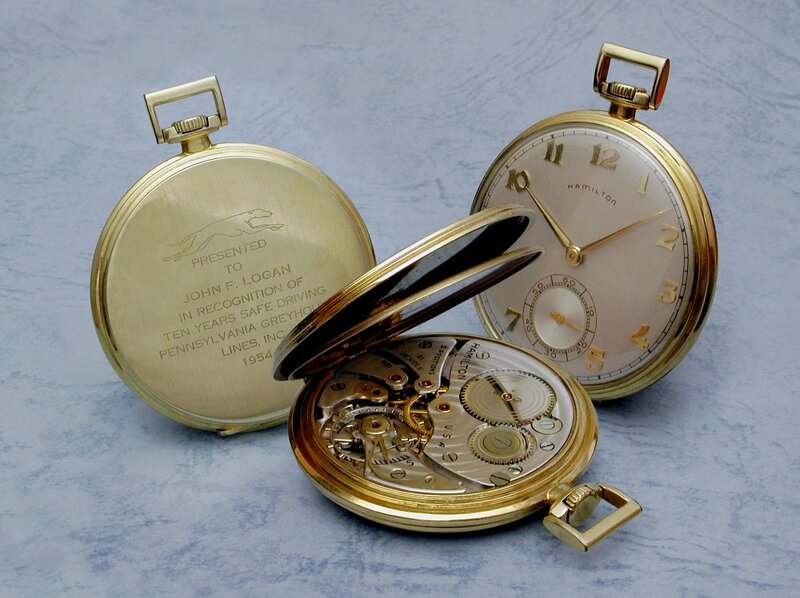 The movements were offered in both solid gold and gold filled cases in a variety of models. 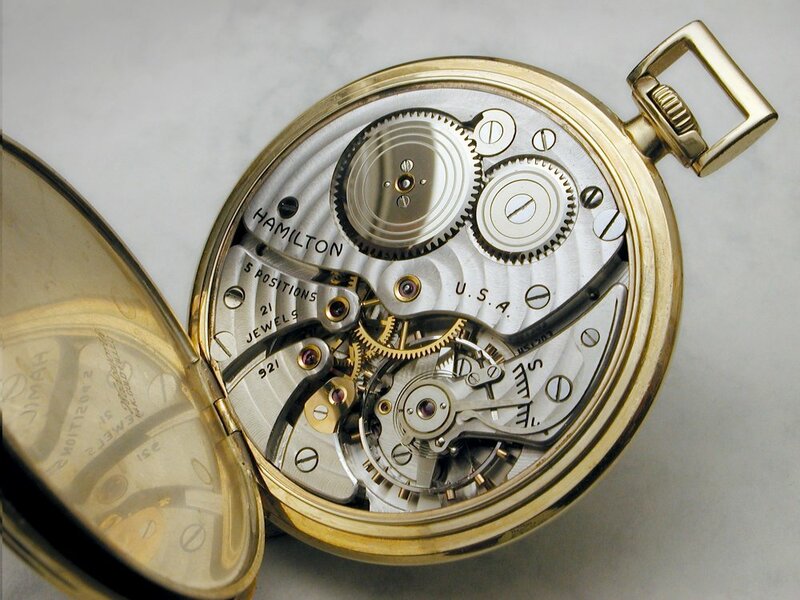 Whilst not made in greatly limited numbers many of the solid gold watches have had their cases scrapped for the gold content and, also, this size Hamilton movement has of more recent times become popular for use in large custom-made wristwatches. Add in natural attrition and it is becoming more difficult to find clean 921 examples in their original pocket watch form. The 21 jewel Grade 921 is a high-grade movement, being the middle grade in the Hamilton 10 size family which also had 17 and 23 jewel movements, all based around the same architechture with differing treatment of the plates. The Grade 921 features an Elinvar-Extra hairspring and monometallic balance, micrometric regulator, jeweled motor barrel, and is adjusted for temperature and 5 positions. The plates are nickel silver plated with rhodium. My example shown below was produced in 1953 and has the model name of "Elton". 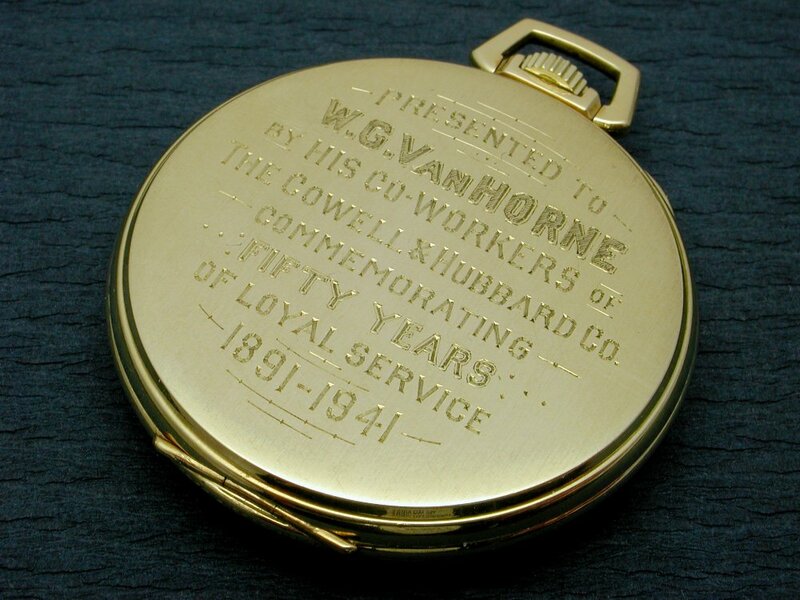 The grade was often used in presentation watches as per this example, being an award watch to a Greyhound Lines driver for ten years service. This image combines three views of the one watch. (You can find the results of some research into this watch and its owner in this post). 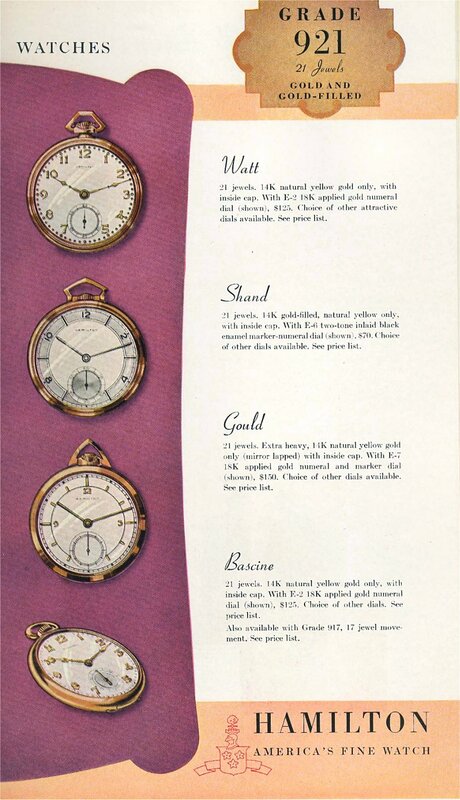 A Hamilton catalogue page showing some of their Grade 921 watches for 1938. 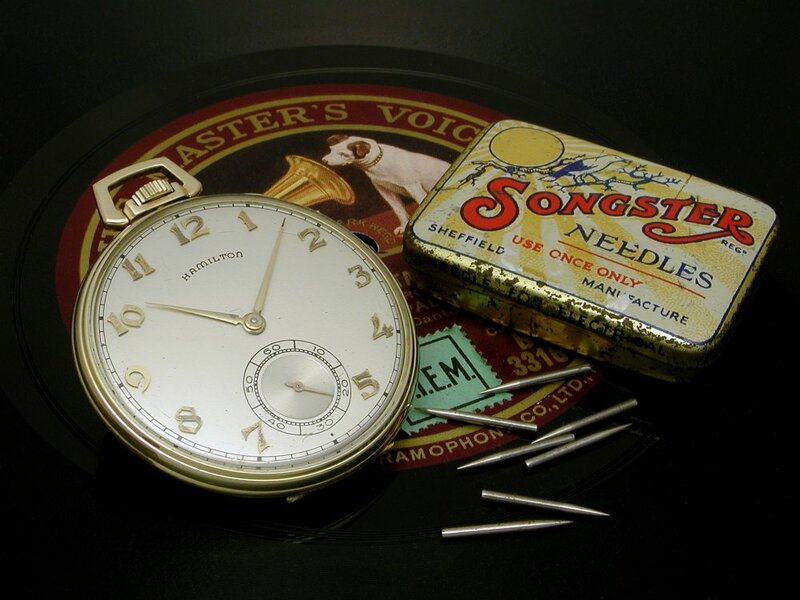 Here's another example of a Grade 921 watch, this one produced in 1940, with a interesting caseback inscription. (You can find the results of some research into this watch and its owner in this post). (Watch owned by Rob B). 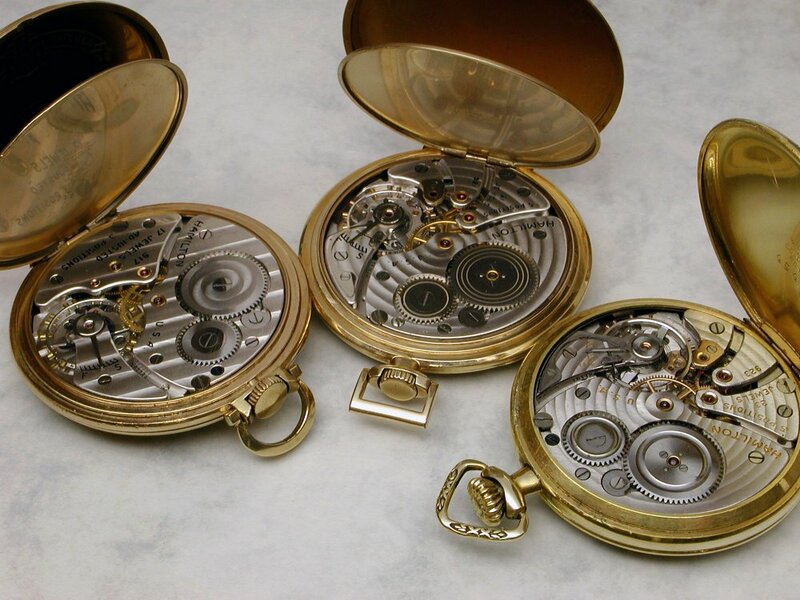 Below a Grade 921 watch is shown in the middle between two other of the Hamilton 10 size movement family, the 17 jewel Grade 917 on the left and the 23 jewel Grade 923 on the right, (there's also the 23 jewel Grade 945, not shown).